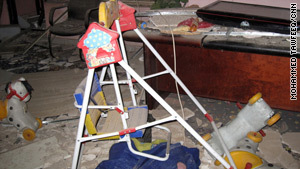 Toys scattered in the rubble of a kindergarten at the bombed Justice Ministry. BAGHDAD, Iraq (CNN) -- An umbrella group affiliated with al Qaeda in Iraq claimed responsibility Tuesday for a pair of weekend bombings that killed 160 people in Baghdad. The Islamic State of Iraq issued a statement saying it carried out the attacks. The authenticity of the claim could not immediately be verified, but it appeared on a Web site frequently used by the group. The group also claimed responsibility for nearly identical truck bombings that struck the Foreign and Finance ministries on August 19, killing at least 100 and wounding hundreds more. Sunday's attacks -- which wounded at least 540 people, in addition to those killed -- were the deadliest in the capital in more than two years, the Interior Ministry said Monday. The bombs detonated in quick succession about 10:30 a.m. outside the Justice Ministry and another government building. Plumes of smoke billowed from the sites as victims fled, some with blood streaming down their faces. The streets were strewn with debris, including charred cars and chunks of concrete. Some government buildings and others in the area were heavily damaged. Iraqi officials on Tuesday released security camera video of the two weekend bombings. The blasts sparked questions about Iraq's security and national elections planned for January. Iraqi Prime Minister Nuri al-Maliki, who visited the scene shortly after the explosions, said holding the elections as scheduled would send a strong message to the attackers. "The cowardly attack ... should not affect the determination of the Iraqi people from continuing their battle against the deposed regime and the gangs of the criminal Baath party, and the terrorist al Qaeda organization,'" al-Maliki said in a written statement. President Obama called the attacks an attempt to derail progress in Iraq and pledged to work closely with the country as it prepares for elections. Obama spoke with the prime minister and Iraqi President Jalal Talabani to express his condolences and reiterate U.S. support. The August attacks led to tightened security in Baghdad, including the addition of blast walls and security checkpoints. Sunday's attacks were the deadliest on Iraqi civilians since three truck bombings killed hundreds in August 2007 in Qahtaniya in northern Iraq. Iraqis are supposed to go to the polls in January, but passage of an election law is needed first. Late Monday, Iraqi leaders reached tentative agreement on a draft of such a law. U.S. and Iraqi government officials say the election is a vital step in Iraqi efforts to solidify a democratic system in the post-Saddam Hussein era. CNN's Saad Abedine contributed to this report.